National Gift Card is the best place for you to order P.F. Chang’s gift cards in bulk. We are the experts in all things gift cards and can set up your gift card solutions program for you today. Please contact us for more information on P.F. Chang’s bulk, direct-to-recipient, or individual gift card fulfillment for your gift card program. Contact us here or call us at 888-472-8747 today. Purchase or use of P.F. Chang’s prepaid gift cards, issued by PFCCB Gift Card, Inc., constitutes acceptance of the following terms and conditions. This card is redeemable only for food and beverages at participating P.F. Chang’s locations in the contiguous United States, excluding airport locations. This card has no fees or expiration date. This card must be presented for all purchases, and cannot be redeemed or exchanged for gift cards or cash, except where and to the extent required by law. If lost, damaged, or stolen, we will, upon presentation of verified proof of purchase, offer a replacement card valued at the balance of this card at the time it is reported to us as lost, stolen, or damaged. Void if sold, purchased, brokered or bartered. These terms and conditions are governed by the laws of the state where the card is purchased. 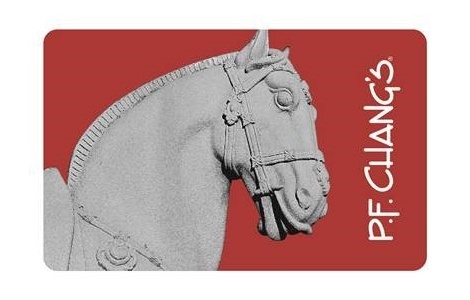 To find a participating location, make a reservation, or check your balance, and for all other inquiries, visit our website at www.pfchangs.com or call 1-866-PFCHANG.